There’s a tell tale trail of icing sugar there..
Flavoured Cocoa powder and flavoured icing sugar. Why has no one thought of this before? It seems so obvious now I’ve seen it. Whilst I’m kicking myself for not being inventive enough to have got there first, I’m very pleased that someone else has put their livelihood on the line for the sake of my tastebuds. I imagine it would be fairly easy to flavour cocoa powder with some synthetic agents, but then why wouldn’t I just use flavourings from the supermarket? Sugar and Crumbs, who have only been trading for 14 weeks, use all natural flavourings. It’s relatively easy to get natural peppermint of vanilla flavouring, but not so easy to get things like ‘black cherry’ or naturally made versions of flavours such as ‘strawberry milkshake’. They currently sell 20 flavours of icing sugar and 5 of cocoa. One of my favourite things about their range is the packaging – the little press-to-close airtight pouches are so much less messy and more compact than standard sugar boxes. So, the theory is great – natural flavourings, less things in my cupboard, pre-balanced flavour combinations….but do they taste any good? 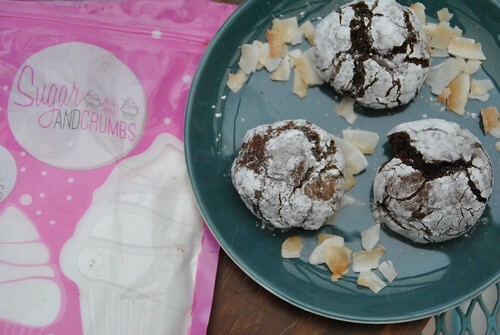 Sugar and Crumbs sent me their Coconut cocoa (from £2.99 for 150g), Pear Drop icing sugar and Turkish Delight icing sugar (from £2.99 for 250g) to test. I have to admit that I drank most of the cocoa as a hot drink. I loved it and didn’t really want to share. It’s a good strong hit as a drink but mellows pleasantly in baking. One benefit of these products is that you can use them in recipes that might not otherwise stand up to the texture / acidity or other aspects of the raw item. For example, I baked crack cookies with the coconut cocoa. They just wouldn’t have worked as well if I’d have put desiccated coconut in them as it would change the craggy exterior too much. Also, lots of people don’t like the texture of coconut. I rolled the cookies in the Pear Drop icing sugar which added a nice fruity boost to them. Interestingly, whilst the flavours are naturally made they do achieve the true pear drop flavour, which I suspect was never very natural! Yes, S&C sent me these for free to test, but to sum up my thoughts on their product – well, I’ve just ordered Cherry cocoa and Pistachio icing sugar. In a large bowl mix the cocoa, sugars and oil. Now add the vanilla bean paste and eggs. Beat until combined. In a separate bowl weigh out the flour, baking powder, xantham gum and salt and stir through so all is evenly distributed. Stir into the cocoa mixture. It’ll be relatively stiff. Pour some icing sugar into a shallow tuppaware or bowl. Take chunks of the dough and roll into 1inch (2.5cm) diameter balls. Roll each ball in the icing sugar and put on a greased baking tray. They won’t spread very much. Bake for 15 minutes (check after 10). They are very soft when they come out so wait for them to cool before taking off the tray. These look delicious! And flavored cocoa powder- such a fun idea! The flavoured cocoas sound lovely and the cookies look really tempting too! Thanks. I’m getting the cherry flavoured cocoa and the pistachio icing sugar next. Looking forward to having a play. I’ll warn you now – it’s not good for the bank balance. There’s so many interesting flavours to play with! yum yum yum! 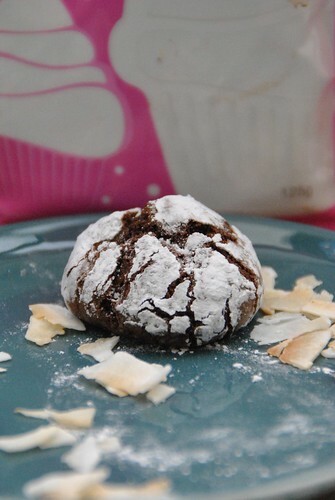 I SO want to try coconut cocoa powder – it sounds completely amazing!! This website is going to be dangerous – strawberry milkshake flavoured icing sugar? wow!! I KNOW!! And I spoke to the lady last night and she said they are developing more flavours. Great sounding products and what a lovely thing to make with them. Pear drop icing sugar? Willy Wonka would be super proud! These are sure to be a massive hit!